The dance-dramas of Laos were originally only performed or the royal court. 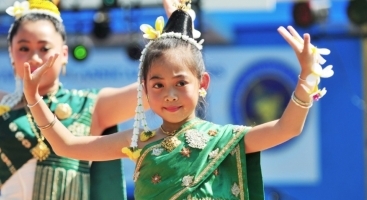 The dance-dramas and musical accompaniment are all very similar to those of Thai and Cambodian classical dances. According the first ruler LanXang, he and a large army of Kmer soldiers were accompanied by many female dancers from the court of Angkor. Other historical epics like Sin Xay divided Lao classical dance into two main forms, khno and lakhone. Each is accompanied by Lao classical music. Kon is the most typical of the Lao dance-dramas, with trouples of male and female dancers in elaborate costumes and masks performing very graceful movements demonstrating their great flexibility, and vry common dance- drama form for PhraLakPhra Ram. Each dancer plays a character in the drama, although most of the narration comes from a singing chorus to the side. Lakhoe dances are usually only performed by females, but male lakhone dancers are not unknown. Instead of each dancer portraying an individual character, such as the Khon dance-dramas, the dancers mimic the scene and events together. There is more variety of dance- dramas performed in the Lakhon tradition. Lam Lao, also known as Morlam is the general descriptor for Lao folk music, which at its most basic level consists of the singer/ story - teller and the Khene.